There were so many things Abby wasn’t psyched to eat when she was three. Most things, actually. Fish, for example. She threw up when we made her eat flounder. Carrots (she couldn’t chew them). Waffles (she only ate pancakes). Eggs (they smelled horrible). Green beans. Pork chops. Yellow cheese. Tomatoes. Macaroni and Cheese (for Chrissakes!). We once went four straight weeks — no joke — when Abby basically rejected all solid food, and there but for the grace of Pediasure… well, I don’t even want to think about what would have happened had it not been for Pediasure. What she did eat during those dark days: pasta with butter and “Abby’s spice” (garlic salt); pizza; apples with peanut butter; and breaded chicken (as long as it was drowned in ketchup). Then one summer weekend a couple years ago, when we went to visit my brother Tony in upstate New York, she discovered the joys of steak, and our lives got a little bit better. Tony had taken a flank steak, marinated it forever in teriyaki sauce, and grilled it. He sliced it thin. Abby was, of course, initially skeptical. We begged her and tried to reason with her and explained how steak was exactly like a hamburger, only sliced instead of chopped — can’t you see that? — and finally bribed her (you want ice cream tonight, right?) to have a bite, one bite… at which point her stubborn little mind was blown. She had seconds, and then thirds, and “Tony’s steak” was born. Ever since that day, Abby has judged all meat dishes by this standard, her gold standard. Add all the marinade ingredients to a large ziploc bag. Add steak, seal it, and marinate in the refrigerator for about 4 hours. 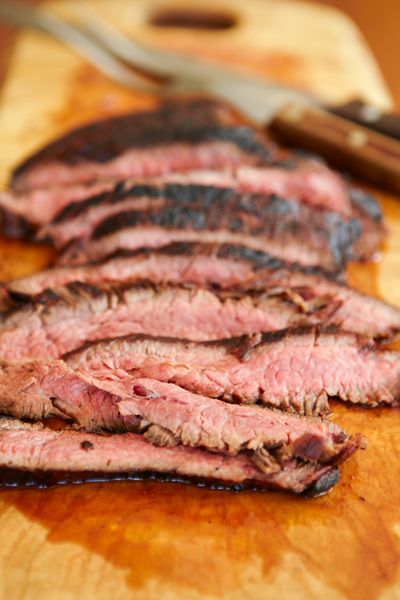 When it’s time to grill, cook about 4 minutes a side (flank steak is thin, and it’s easy to overcook), remove, and let sit for ten minutes before cutting. Slice on the bias and serve with lots of vegetables. Even though it’s relatively lean, a little of this goes a long way. Andy – This makes me feel so much better about my situation. My son is three years old and hardly eats anything. (He makes Abby at three look like a great eater!) It gives me hope that one day he might be eating quinoa and mackaral just like your daughter is now. Thank you!! My son is 4 and a half and he has gone from normal to picky to extremely picky. It disturbs me. It makes me mad. He also threw up once when I made him have one bite of quiche. Hi, a question from Sweden – is “hot sauce” a brand or just any hot sauce, like sambal oelek? By the way, I love to follow your blog. Makes me think of Dobbs Ferry. You should have seen Meredith when I gave her cottage cheese the other day. Yes, in comparison to Mer, Abby looks like a foodie ready for her own blog. That said, I celebrate your success and look forward to celebrating at home as well! Melissa -LOVE the idea of Meredith’s blog…you should do it! LOVE your easy marinades…my almost-10-yr-old likes steak (one of her few, but growing, “acceptable” dinner items), but I am so. darn. tired. of the same old thing…this marinade should be OK…and fool my fried brain into thinking I’m serving something “different” Thanks! I’m a vegetarian but the rest of the family LOVES meat. I was amazed that today’s flank steaks are not the tough skirts of my youth. We used to have ribeyes once or twice a week. I can’t wait to try Tony’s out on the fam. Just wanted to let you know that I gave you an award on my blog: http://nycshare.blogspot.com/2010/08/cherry-on-top-award_25.html. Always love reading your posts. Tony’s Steak has now been added to our menu! Love this site and look forward to trying out more recipes. Thanks for making Dinner: A love story for us. I marinated cut up tri tip from Trader Joe’s in this and grilled it as kabobs. Super yummy! This has a place in my permanant recipe file, along with your yogurt marinated chicken which we have some variation of at least once a week. Thank you! A huge hit — this is delicious and simple, especially making the marinade the night before, getting the steak in it by morning. A simple, lovely main dish for dinner! My 10 yr old — loves it! Tony’s steak is wonderful. The steak dinner turned out great. The grilled and marinated grass fed and organic meat was amazing. I think that the most important part to making a good meal is finding the right Steak Recipes, as well as the right steak. LaCense Beef is a great resource for both of these. While I work for them, they honestly offer some truly tasty recipes to try, as well as high quality, grass fed beef that you can order. They are really worth checking out. 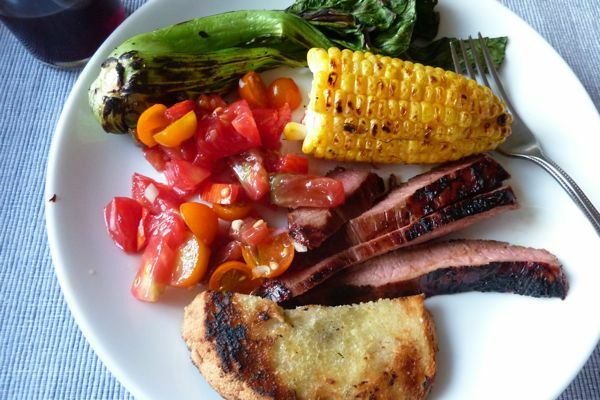 this combination sounds lovely — we’re always looking for new ways to enjoy flank steak! PS: Your newsletter sent me. Do I win the apron? Coffee is shooting out my nose!!!! Oh my god. I can’t stop laughing. I just found your website this morning, as I sit here at 9am dreading making another dinner tonight. Your website is hilarious, so real and I think might actually help me! Thank you, thank you. Tony’s steak it is for dinner tonight… and maybe a veggie cake for dessert. Cheers! My husband will be totally pumped when I make this recipe. I recently picked up your book and I love it! My life is in “stage one” of your book. Reading your posts and flipping through your awesome cookbook have served as part wake-up call for what is ahead, and part permission not to freak about things being perfect. Thanks for both! When I make beef teriyaki, I cut the meat into long strpis, marinate the beef in the sauce overnight. I remove it from the sauce and place the beef over paper towel to remove the excess sauce. Stir fry it, then remove it from wok. Then add vegetables like mushroom, snap peas, and red bell pepper cut into long thin strpis into the hot wok, stir fry it, add the remaining sauce that the beef had been sitting in, continue stir fry for a minute, then add beans sprouts and the beef. Since I discovered this recipe in the pages of Bon Appetit I have made it once a week, much to the satisfaction of my husband. The recipe led me to your web site, which led me to your book. I have since recommended the entire shebang to my brother, who is dealing with two picky eaters (ages 13 and 11 – far too old to still be picky), as well as to all neighbors with children or without. Not only do you guys read as being so human and likeable, but your recipes are completely DELISH. I find that they respect my time and my desire to sit down and eat something great at the end of a busy day. So glad to have found you; you are just the kind of kitchen buddy I love. This looks delicious! I’ve never grilled flank steak before (or any steak for that matter). I’m more a chicken, hamburger, hot dog griller. 🙂 For a gas grill, would you use medium, indirect heat or something else? Thanks for a great website — love it! And parenting stuff changes so quickly! Nowadays, you’re not supposed to comment on or react to your kids eating or not eating, since they can turn it around on you and refuse to eat if they get a reaction (or have issues with food later).